Get a glimpse of what goes on behind the scenes when you join the Trainer for a Day Vallarta Adventure Tour. This extraordinary experience not only offers close encounters with the dolphins but also the opportunity to learn about how these magnificent creatures are fed, cared for and trained. When you become a dolphin trainer for a day you’ll have seven hours to work directly with experienced trainers, who will guide you through hands-on activities and interactions both in and out of the water. 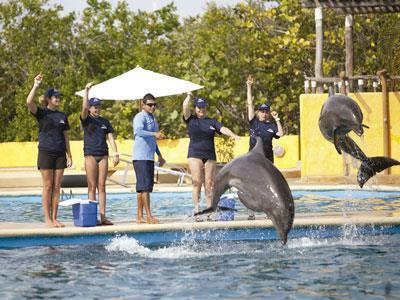 Spending the day at this Puerto Vallarta attraction is a fun and fascinating way to discover everything you’ve ever wanted to know about dolphins.